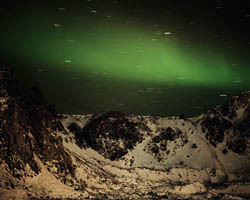 Shot on location in Iceland, Dan Holdsworth’s Untitled (Hyperborea) series unfolds like an elaborate set from a science fiction film. 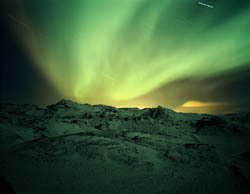 Picturing the landscape at night, the eerie lighting effects are not the result of computer manipulation, but rather the natural occurrence of the Northern Lights bathing the barren, volcanic countryside. 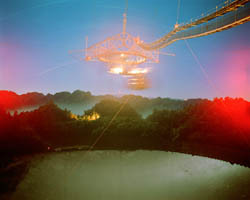 Photographed with long exposures, Holdsworth’s landscapes develop a supernatural glow, making the mountains and rivers appear alien and atomic; the recognisable features of distant buildings, cars, and passing aeroplanes lend a disturbing familiarity to the apocalyptic scenes. 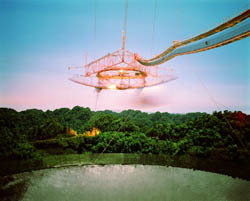 Dan Holdsworth’s Untitled (The Gregorian) images were taken at the American National Astronomy and Ionosphere Centre in Puerto Rico; the UFO-like form is in actuality part of the Arecibo Space Telescope. 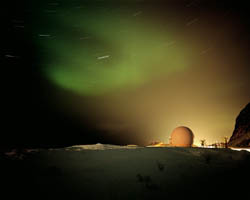 Photographed a night with exposures up to four hours, the unusual location of an aeronautics station nestled deep in a jungle gains an even more mysterious aura; as the acidic hues captured on film translate with the graphic effect of video games. 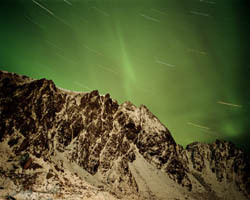 Through his exploration of the natural world through the simple mechanisation of photography, Holdsworth defines a modern spiritualism, a humbling reminder of the scope of things yet undiscovered. Time to Play?, APT Web Gallery, Artist Pension Trust, Participant Inc. 253 E Houston Street , New York, NYC, USA with Time to Play?, APT Web Gallery, Artist Pension Trust, 253 E Houston Street, NYC, USA.